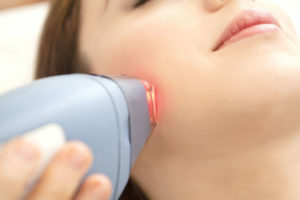 Dermatologists use lasers to remove unwanted facial and body hair safely and effectively. In this procedure, exposure to pulses of laser light destroys the hair follicle. Pigment in the follicles absorb the light, that destroys the hair. Each pulse of the laser takes a fraction of a second and can treat many hairs at the same time. Removing the unwanted hair often requires a few sessions/sittings. Patients may need between 4 to 6 treatments. Multiple treatments depending on the type of hair and skin colour have been shown to provide long-term reduction of hair. Afterwards, most patients are free of the unwanted hair for several months. When the hair regrows, most patients see noticeably less hair than before. The hair also tends to be finer and lighter in colour. The laser hair removal can be repeated if the hair regrows. Several wavelengths of laser energy have been used for hair removal, from visible light to near-infrared rays. These lasers are characterized by their wavelength, measured in nano-meters. While the procedure involved in the laser treatment is usually risk-free, there might be some side effects of laser hair removal to consider. The use of a laser to remove unwanted hair involves a lot of heat to burn the hair. This can lead to skin burns in some users. Temporary side effects like discomfort, itching, swelling, redness are common. Skin hyperpigmentation or hypopigmentation may occur. IPL can permanently reduce hair growth, most effectively in darker, coarser hair. Broad-spectrum light is applied to the surface of the skin, targeting melanin. This light travels through the skin until it strikes the roots of the hair follicle. The highest concentration of melanin is located in the bulb of the hair follicles. As the light is absorbed, the bulb and most of the hair shaft are heated, destroying the hair-producing papilla.